ANUP-International together with Prof. Paul Marcu, general director of the General Directorate for Social Assistance and Child Protection of Ialomita County (DGASPC –Ialomita) planned a training and information Conference. 53 social workers from almost all the villages and towns in Ialomita County attended the Conference, as well members of the local police, judiciary and local government. Prof. Marcu saw a great need for this Conference and the desire for social workers to be trained in this area. Participants of the Conference were given the Sunia Geel Domestic Violence Trainee Pack (translated from the Exchange House trainee pack). Ms. Manuela Iordache, coordinator of the Centrul de Primire in Regim de Urgenta pentru Victimele Violentei in Familie (Emergency and Reception Centre for the Victims of Domestic Violence) stated in her presentation to the Conference that the pack was extremely useful in the work they do. Heydi Foster, director of Exchange House, was asked make presentation on Sunia Geel and some of the conclusions expressed in the state of the art report and the Sunia Geel survey. The various presentations gave rise to many constructive and positive questions and debates between the various representations at the Conference, such as the local police, judiciary, Town Hall officials, local church and social workers. Everyone believed it was a really useful exchange of experiences between partners of two different countries, with different approaches, practices and policies, but the same issues in combating and preventing domestic violence. 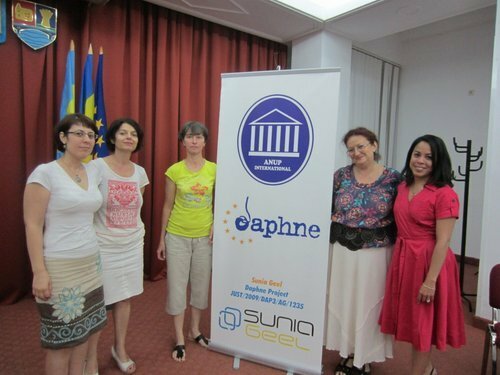 The Conference formed part of an awareness campaign addressed to people, women especially, in the city of Slobozia, and its surroundings. The campaign was to raise awareness of the services the DGASPC and what it does in combating domestic violence. Ms. Matei Nicoleta and Ms. Alexa Carmen, psychologists, in coordination with the psychologist Ms. Ratunzeanu Luminita, produced a flyer which was distributed to 70 women, on the streets of Slobozia. Since this campaign half of these women have received counselling at the Centrul Cultral Ionel Perlea, where the Conference took place. The Conference was a complete success and a wonderful day for ANUP-International. The Conference was recorded by a local television station and broadcast that evening on prime time.